In this article we feature the story of the Penn Avenue Flats and how Abbey Bridge came to be. Many readers may be unaware that these two, the flats and the road, share a common link - that of Sir Jesse Boot. In 1920 Boots had been bought out by an American firm, the United Drug Company, and Jesse Boot found himself the richer by the sum of £2.5 million. He immediately gave substantial donations to a number of worthy causes and then embarked on a series of projects for the benefit of Nottingham and its inhabitants. Having bought the Highfields Estate, he decided that a major road across it was needed in order to provide a new route between Nottingham and Beeston. At a cost of £20,000 he eventually had University Boulevard constructed. Until then the houses on Beeston Road in Dunkirk had faced on to what was to all intents a cul-de-sac with a mere footpath at the end leading off to Beeston. As a new Boulevard was now to be tacked on to its end Beeston Road would inevitably have to be widened. In 1924 Jesse Boot persuaded the City Council that it should carry this out. Their subsequent negotiations to acquire the frontages were made somewhat simpler by the fact that Jesse Boot had already become the owner of practically every property on both sides of the road. After travelling along Jesse Boot's new thoroughfare and then along Beeston Road, those bound for Nottingham would have to proceed along Abbey Street, which no doubt Jesse Boot envisaged would also be widened. Then, however, the traveller would have to pass along Gregory Street, Church Street or Sherwin Road. These narrow streets would not suffice. What was needed was a new road from the end of Abbey Street connecting directly with Castle Boulevard. Jesse Boot put out feelers and plans for such a road were submitted to the City Council. If this new road was to form the continuation of Abbey Street, it would have to go through the White Hart's extensive gardens, which in turn would mean the demolition of its numerous outbuildings. After that it would go across open land until it reached the railway line. Once over the railway it would be a matter of choosing a suitable place to join up with Castle Boulevard. 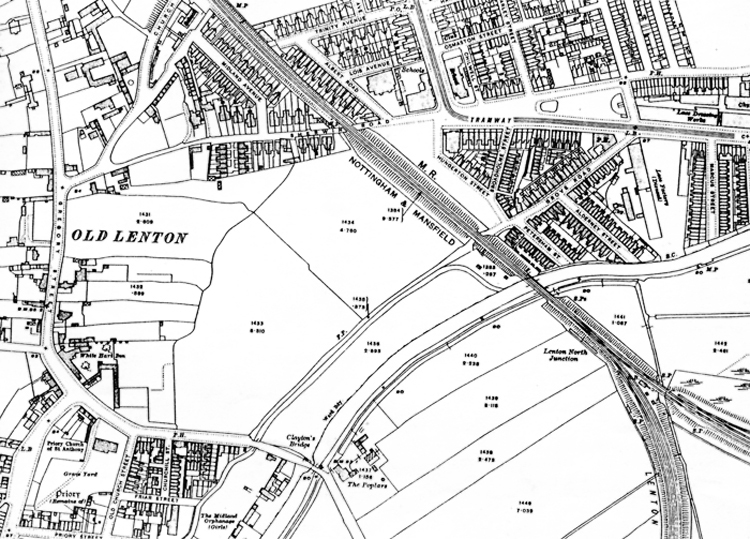 As can be seen from the section of the Ordnance Survey map for 1915 shown to the left, the minimum disturbance would have been caused, had it been possible to bring the new road out at the junction of Lenton and Castle Boulevards with Sherwin Road. Unfortunately the incline of the road needed to clear the railway line at this point would have been too severe and so a route with a gentler gradient was needed. As all who travel along Abbey Bridge will know, the chosen point of entry on to Castle Boulevard was alongside the Grove Hotel. The estimated cost of the scheme submitted to the Council in October 1922 was £90,290 which included £22,280 for the cost of re-housing those displaced by the new road - for some thirty five houses on Castle Boulevard would have to come down to make way for the proposed road. The Council initially reached no decision but referred the proposals to several of its committees for further consideration. These also failed to come to a definite conclusion. By July 1924 Jesse Boot was getting a little anxious over the fate of the scheme and a letter was sent on his behalf suggesting that it was time to proceed with the scheme. The Council relieved Jesse Boot of his anxiety and agreed to the new road. Mr. T.S. Pearson Gregory, the major landowner in the Lenton area, was approached to see if he was prepared to sell such land as was needed for the road and for suitable sites on which new houses for the disposed tenants could be built. An area of 15¾ acres was finally purchased at a cost of £8,000 plus £55 13s 0d surveyor's fees. The Council also began the negotiations for the properties that would have to be demolished and started to process the trade claims in those cases where the premises contained a shop or a business. These dealings carried on throughout 1925 and the early part of 1926. As the City Council was committing itself to quite considerable expenditure, it must have been heartened to learn that the Ministry of Transport was willing to provide £32,908 towards the cost of the scheme. Before the properties could be demolished, the Ministry of Health had insisted that new homes must be ready for the tenants. Jesse Boot could see further delays, while the Council sorted this problem out. In order to circumvent such delays, in November 1925, he offered to pay for the erection of sufficient new dwellings himself. The Council quickly approved the idea, sold him a portion of land near the corner of Sherwin Road and Gregory Street and expressed their 'deep appreciation of Sir Jesse Boot's valuable assistance'. In February 1927 firms submitted tenders for the demolition of the properties and the figure of £l50 15s 0d from Hawley Bros, of 18 Fisher Gate was accepted. The only oddity from a modern standpoint was that it was the demolition firm who were paying the money to the Council. Evidently the value of the materials salvaged was more than sufficient to offset the cost of the demolition. By the following November the Town Clerk would report that all the houses and shops had been vacated and demolished with the exception of the shop at 295 Castle Boulevard. The tenant, Mr. Joseph Johnson, still had another four months of his lease to run. This was holding up construction of the road, but the tenant was willing to discuss terms. Realising Mr. Johnson held the whip hand, the Council offered him £50 to surrender his tenancy. This was duly accepted. Work on the bridge over the railway had already started and by March 1928 was almost complete. A number of small businesses applied to rent the spaces between the arches. As the bridge had cost £15,000 to build, the Council were keen to get as much money as possible for their rent, and repeatedly turned down all offers. Eventually Moss & Alvey, timber merchants, were given occupancy of five of these arches at a charge of £2 10s 0d a week. We have no exact date as to when the new road was finally opened, but we assume it must have been some time during 1928. Jesse Boot had had to purchase the land for the new dwellings, but the Council agreed to provide main drainage and make up the approach road, subsequently called Penn Avenue. Pen, the name for a female swan, is locally held to be the source of the street's name. The area on which the flats were built was formerly marshland where swans and other water birds made their nests. Given the difference in spelling, this origin might be questioned. We have, however, no alternative explanation. In early 1926 building regulations approval was sought and obtained for the proposed development. The plans submitted involved the construction of three blocks, each of three storeys, containing a total of forty eight maisonettes, forty four with three bedrooms and four in the central block with four bedrooms. The plans were submitted on behalf of Sir Jesse Boot by a firm called A. Eaton & Son. We don't know whether they were the solicitors or the architects, but given that the designs are rather reminiscent of London tenement blocks, it might be assumed that the architects, whoever they were, weren't a local firm. At some stage, unknown to us, Jesse Boot then handed over management of the flats to the trustees of the Boots Pension Fund. 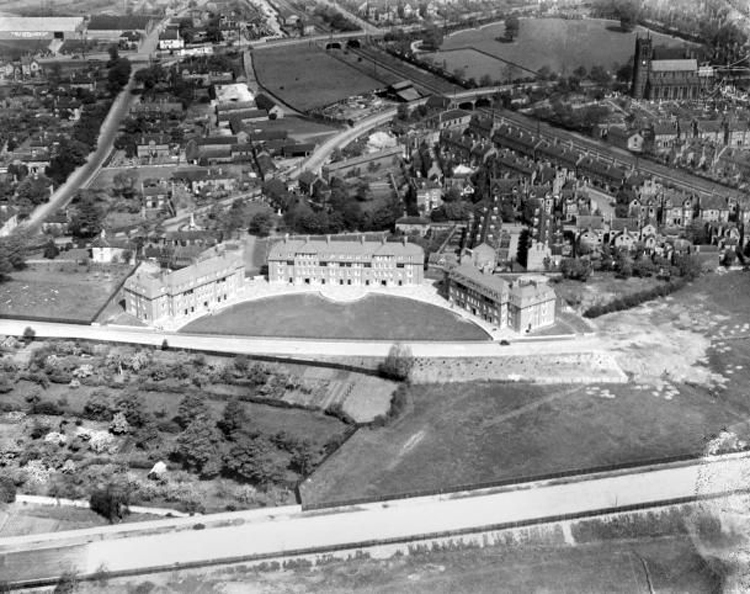 This aerial photograph, courtesy of Aerofilms Ltd., was taken in 1927. In the centre of the picture are the newly erected Penn Avenue Flats. Visible at the bottom is a portion of the road, subsequently called Abbey Bridge, which was then under construction. Mrs. Mary Wright's parents, Arthur and Anne Roe, were one of the first families successfully to apply for one of the maisonettes. 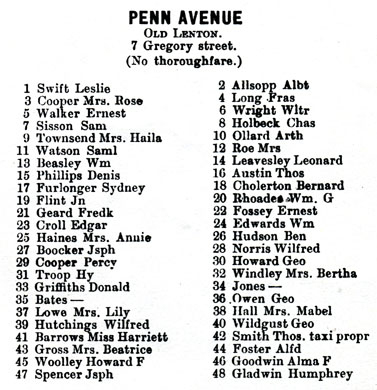 Surprisingly the Roe family lived on Willoughby Street. Moreover she doesn't remember many of the first residents coming from the Castle Boulevard area. All of which would suggest that many of the people for whom the flats were meant, chose to go elsewhere. Quite possibly they were put off by the rents. Tenants were charged 17 shillings a week, when ten shillings was usually quite sufficient to obtain decent accommodation elsewhere in the City. The maisonettes were viewed as rather superior residences and Boots insisted that tenants behave in an equally superior manner. There was an extensive list of does and don'ts which Mr. Price, the caretaker who lived on the site, made sure was adhered to. Washing had to be hung out in the downstairs drying area; no one was permitted to display a line of washing on the balconies. Mr. Price would simply come and cut down the clothesline of anyone flouting this rule. Mrs Wright recalls an occasion when her brother had jumped into the canal to rescue a drowning child. Once home he had removed his wet clothes and because of their stench, these had been left outside. The eagle-eyed Mr. Price soon noticed this infringement and was immediately around ordering their removal. Mr. Price, to give him his due, worked hard to ensure the flats were always looking spick and span. He regularly washed down the flights of stone steps, and also periodically cleaned out the drains. From the cover photograph you can see there was a large expanse of lawn at the front of the flats and Mr. Price made sure that this was always looking in tiptop condition, either through his own efforts or those of Boots estate workers. When the Second World War began, the lawn had to make way for an air raid shelter. This was a huge concrete structure, complete with toilets and running water and capable of accommodating all those in the flats. When the sirens sounded, residents would take their blankets and pillows into the shelter and sit or lie on the benches provided, until the all clear was sounded. After the war the shelter was demolished and the huge hole filled in again. Boots were reluctant to meet the cost of regrassing the area and so it was decided to convert the space into allotments. Mrs. Anne Coulthard who lived in the flats between 1937 and 1958 recalls that these allotments were not an unqualified success. There were far more potential gardeners than allotments and so the problem was resolved by means of a draw. A few of those who were unsuccessful were slightly resentful of the eight who took over a plot. Thereafter they kept a close eye on the state of the gardens and lodged complaints if any of the plots failed to impress. Mrs. Coulthard's father, Charles Holbeck, had initially been unlucky, but even when a plot came vacant, he chose not to apply, as he didn't want to be a target of this bickering. will recall some of these names. Beyond the allotments on the other side of Penn Avenue were the gardens of the properties on Gregory Street. Extensive orchards flourished here and provided a pleasant prospect for those looking out from the flats. To the east were houses built by the Council in the mid-thirties on either side of Abbey Bridge. In 1956 the City Council bought most of the land between Penn Avenue and the White Hart from the Pearson Gregory Estates. There was a small strip of land on the south side of Penn Avenue which they didn't own, but which would be required in order to open up the land for redevelopment. So the Council approached the trustees of the Boots Pension Fund about the possibility of acquiring it. They proved amenable, but in the course of negotiations suggested that the Council might like to purchase the whole of the Penn Avenue site including the flats. The Council were equally amenable and agreed to purchase the properties for about £20,000 and in 1957 ownership of the Penn Avenue flats changed hands. Mrs. Wright recalls that many of the residents were pleased at the prospect of the change to Council ownership, as they thought there would be fewer restrictions on what they could or could not do in the flats. The Council chose to dispense with the services of Mr. Long, the successor to Mr. Price, deciding that the flats didn't need the personal attentions of a caretaker. In the ensuing years, however, many residents came to miss his presence. It took longer to get minor repairs attended to, the flats were never quite as smart, and some residents came to feel that the tone of the flats had become rather too free and easy. The village atmosphere, which somehow prevailed in the Avenue, was disappearing and residents were no longer quite so neighbourly as before. In the last year or so the flats have undergone something of a transformation inside and out. Inside each maisonette has been fully modernised by the Council. New baths, sinks etc. have been put in, central heating has been installed, everywhere has been rewired and the painters and decorators have left the flats looking bright and cheerful. It was all rather chaotic there while these improvements were being carried out, but now that the workmen have finished, everything is back to normal. Outside at the back of the flats, as we reported in Issue No. 21, the drying area has undergone major changes with the introduction of trees, shrubs and grassed areas along with the provision of some fixed play equipment meant for toddlers. This has improved the appearance of what was once a rather bleak landscape, but inevitably it has become the meeting place for local youth, many of them not living on the Avenue - which annoys quite a few of the actual residents of the flats. Moreover some mindless acts of minor vandalism recently are slowly wrecking the Council's best intentions. Until recently the allotments at the front were generally well cared for, but in the last year or so they have become somewhat neglected and the area is now just a wilderness used as a playground by youngsters and stray dogs. For some of the older residents it is saddening to look out on it and recall how glorious it all looked before the war. Presumably the Council will not allow it to remain as it is much longer, but what should be put in its place is another problem - car parking, garages, fresh allotments, or perhaps a properly grassed play area? There is, as they say, scope for improvement.